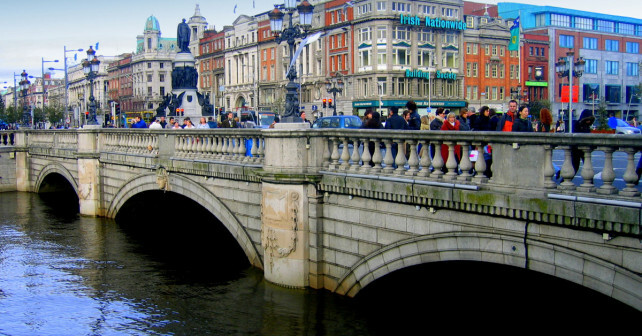 Well over a thousand years old, Dublin has its roots in Gaelic and Viking settlements on the river Liffey. This is an elegant city, which despite centuries of strife, still has many fine old buildings. In Medieval times it was a stronghold of English rule and Queen Elizabeth I established the famous Trinity College in the city in 1592. During the Enlightenment, Dublin was celebrated for its architecture and love of music. It also developed a strong literary tradition, which came to include figures like Jonathan Swift and James Joyce. In 1922 it became the capital of the independent Irish Republic. Visitors to Dublin will love its architecture, from the medieval splendour of Christ Church Cathedral to the simple elegance of Halfpenny Bridge. Dublin Castle is not to be missed and a tour of its rooms will reveal much about the city’s history. For anyone looking for a break from urban vistas, it is easy to escape into the beautiful Botanic Gardens, whose horticultural treasures reflect the city’s history as a major centre of world trade. St Stephen’s Green also provides a rural idyll within the city and will be of particular interest to fans of Joyce’s ‘Ulysses’. Dublin is a very family friendly city and kids will particularly love Dublinia, where they can enjoy an interactive experience of Viking and medieval times. They’ll also have a great time at the Science Gallery, where there are lots of hands-on educational exhibits to check out. For older visitors, the Tall Ship and Famine Museum tells the story of the Irish diaspora and the tough conditions that forced many people to seek their fortunes elsewhere. The Dublin Writers’ Museum will intrigue lovers of literature, while in Trinity College Library visitors can view the original illuminated manuscript of the Book of Kells. Dublin City Gallery, the Hugh Lane, incorporates Francis Bacon’s studio and showcases works by the likes of Monet and Renoir, while the National Museum of Ireland brings together some of the country’s greatest art with a large collection of fascinating historical artefacts. Dublin is well connected by train and bus to towns and cities across Ireland. Most major international airlines operate routes into Dublin Airport and the city can also be reached by ferry from the UK. Once there, it’s easy to get around by bus. The taxis are not too expensive and for those who are feeling energetic, hiring a bike provides a great way to explore. Renting a car or hopping on the DART coastal train lets visitors explore the delights of the wider Dublin area. Dublin is full of interesting places to stay and so is the surrounding countryside. The hotels in Ireland are in ideal locations to ensure the perfect Irish getaway. In terms of climate, Dublin has long, mild summers; the best time to visit is between June and September, but there are interesting events and festivals going on all year round.